Most people drink white wine all year, but as the temperature climbs in spring many of us find ourselves reaching for a white bottle more often. That is why you find so many good bottles of white wine popping up now. One of the really nice ones I have come across at a bargain price is the B.R. Cohn Chardonnay. The wine is a beautiful pale yellow in the glass with pleasant citrus aromas. On the palate there is a good balance between ripe fruit and crisp acidity. The grapes come from cool weather sites in the Russian River Valley in Sonoma where the climate allows the grapes to ripen slowly and deliver ripe flavor and refreshing acidity. This wine is from the Silver Label series, sourced from select vineyards in premium wine regions. The series started in 1998 with cabernet sauvignon. For this vintage the company introduced chardonnay and a North Coast pinot noir. 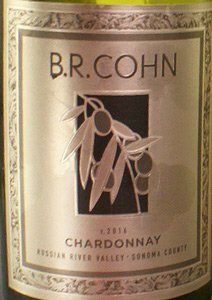 This chardonnay is not Cohn’s rich, voluptuous Carneros chardonnay, which costs about twice as much. I wouldn’t rate one better than the other; they’re just different styles. The Silver Label chard is great as an aperitif and its leaner style pairs well with lighter foods. After harvest the grapes were cold settled and fermented using inoculated yeast strains at low temperatures to preserve fresh aromas. The lees were stirred regularly during the aging process. All the wine underwent malolactic fermentation, which smooths out the flavors. The picturesque winery was right in the middle of last fall’s wildfires, but was spared any major damage. To thank the firefighters and first responders, B.R. Cohn donated all the profits from their annual Sonoma Extra Virgin Festival to the Heart of the Vine Campaign. That effort gives VISA gift cards for basic necessities to winery employees, first responders, friends and neighbors in Napa, Sonoma and Mendocino who lost their homes to the fires. Winery: Winemakers often are compared to musicians and other artists. At B.R. Cohn the bond between music and wine has been strong from its beginning. Winery founder Bruce Cohn has been around music all his life. He managed the Doobie Brothers for 45 years and before that he was involved in the San Francisco Bay area music scene while in college, studying broadcasting and communications. He ran a music rehearsal studio during the day and worked as a television engineer at night. Music was important when he was growing up in Chicago. His father sang Italian arias, and his mother was known to have sung with Frank Sinatra at Chicago nightclubs. The family moved to the San Francisco area in 1956, settling in Sonoma County. In 1974 Bruce bought an old dairy in Glen Ellen. He took an interest in the vineyard on the property and began to develop it. Mentored by Charlie Wagner of Caymus fame, he became involved in all aspects of growing grapes. He sold grapes from his Olive Hill Estate to other wineries, and by 1984 he was ready to start his own B.R. Cohn Winery. Olive Hill was named after the 160-year-old Picholine olive trees that had been brought from France in the mid-1800s and planted on the property. A distinctive drawing of an olive branch appears on the winery’s label. The estate includes 70 acres, 55 planted with cabernet sauvignon, cabernet franc, malbec, merlot, petite sirah and zinfandel. The wine from B.R. Cohn was an immediate hit. The first winemaking team included Merry Edwards, Steve MacRostie and Helen Turley, who went on to have a distinguished career as a winemaker of blockbuster wines. The winery’s cabernet sauvignon got special attention. The Olive Hill vineyard was ideal for cabernet grapes because of underground hot springs and cool ocean breezes that make for a long growing season. The 1980 Gundlach-Bundschu Olive Hill Cabernet made with grapes from Cohn’s property was chosen by the White House as a gift to China, because it represented an outstanding example of California wine. Michael liked the B.R. 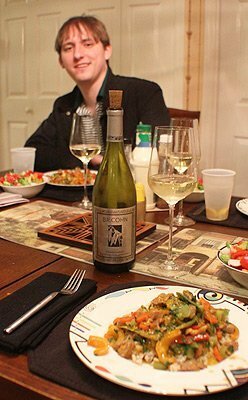 Cohn Chardonnay with pork stir fry. The winery hosts musical concerts and special events throughout the year, donating most of the proceeds to charity. For many years the Doobie Brothers usually performed at the winery each year. The tasting room is in Glen Ellen, about an hour from San Francisco in the Sonoma Valley. It includes a room of Doobie memorabilia. The company created California’s first single estate olive oil in more than a century, and founded the B.R. Cohn Olive Oil Company. Today they produce a selection of olive oils and wine vinegars, which are sold alongside their wines at the estate, as well as in select gourmet shops. The winery is now owned by Vintage Wine Estates. Goes with: I love to stir fry, and this time we tried a new recipe for pork. It had ginger and lots of vegetables, so I knew I would like it. We all loved it. The B.R. Cohn chardonnay was a great match. It has enough body to stand up to the pork and seasonings, and it is light enough to not overwhelm the vegetables. 1. In a small bowl, combine cornstarch and broth until smooth. Stir in the soy sauce, sugar, ginger, garlic powder and pepper flakes; set aside. 2. In a wok or large skillet, stir-fry pork in 1 tablespoon oil until juices run clear. Remove and keep warm. In the same pan, stir-fry vegetables in remaining oil until crisp-tender. 3. Stir broth mixture and add to the vegetables. Bring to a boil; cook and stir for 1 minute or until thickened. Return pork to the pan; heat through. Serve with rice and, if desired, sprinkle with cilantro. The wine also will pair well with salad, seafood and other light meals. Light chicken dishes would be good, as would mild fish such as cod or flounder.